In the approach to the second anniversary of the Sandy Hook Elementary School shooting, a group of "conspiracy theorist" types called Independent Media Solidarity released a full-length documentary detailing their deconstruction of the official government/mainstream narrative of the event. The documentary completely obliterates the official story from every conceivable angle and instead posits a completely fabricated event designed to create a raison d'etre for gun control, school reform, psychiatric medication, and the raising of millions of dollars for the families of the reported victims (many of them government and/or pharma-connected in suspicious ways). The case laid out in the documentary (entitled "We Need to Talk About Sandy Hook") is truly shocking. It it also being "swept under the rug" rather than directly addressed by the powers-that-be, suggesting that some of its revelations may be "inconvenient truths" for them. We will look at two horoscopes using the theories around which this blog is written. Both more or less support the official narrative but do not prove it. This transit chart for reported shooter Adam Lanza on the day of the shooting (posted previously) is absolutely consistent with the transit chart of a killer of at the time of a killing. Transiting Pluto aspecting a spree killer's natal and/or progressed Pallas is a signature which in my experience is always present at the time of the killing. It is, however, not proof. 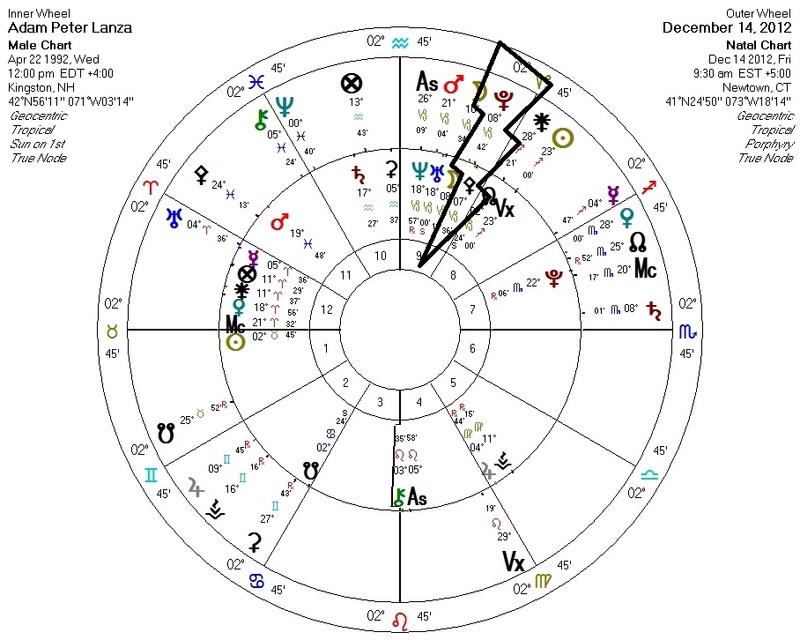 Lanza does not appear to have the Bloodbath Formula on his natal chart, but we would need a time of birth to be sure. 1. Pluto quincunx Jupiter, ruler of Pallas, and indirectly quintile Pallas herself. 2. Neptune on the Second House cusp square Venus. 3. Pluto rules Venus and is quincunx Jupiter (ruling Pisces intercepted in the Second House). 5. Pluto quincunx Jupiter, ruler of Sun. This is also not proof of the official narrative. As we astrologers know, astrology does not reliably trigger specific types of events but rather awakens archetypes in our consciousness: an apparent mass-murder could well carry the same chart as an actual one. 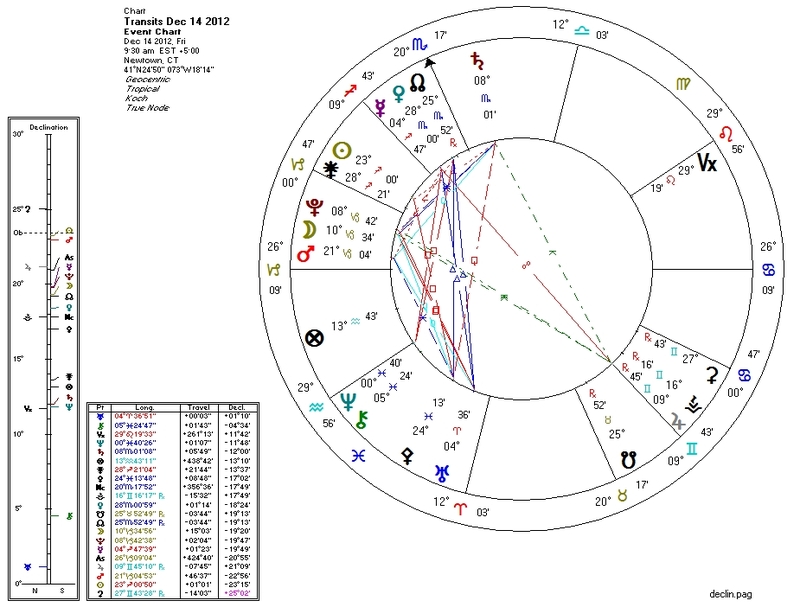 Note also the Twelfth House Mars in this chart: the action is hidden from view.